Extra heavy cast-iron base, trunnion and overarm. Options: PH-14 power down feed, semi-auto air/oil operation. 5HP TEFC motor,1phase 220v or 3 phase 220/440 volt. Please specify. 3450 RPM, 4400 spindle RPM. 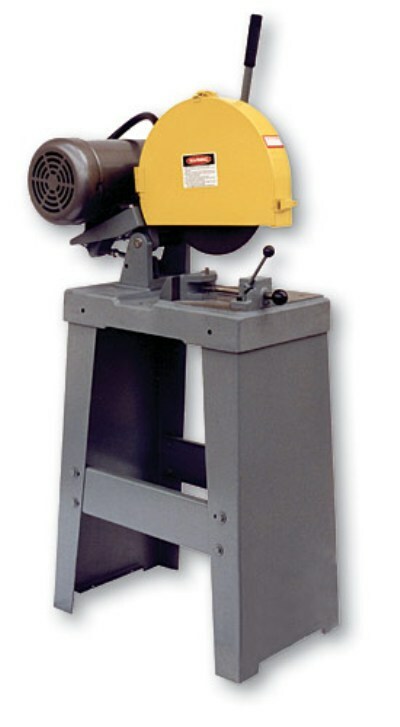 Less abrasive wheel., Wt: 270 lbs. Capacities: 2.5″ solids, 3″ pipe. Model: K12SS-1 5 hp, 1 ph, 220, With Stand. Model: K12SS-3 5 hp, 3 ph, 220/440 With Stand. Model: K12SSF-3 5 hp 3 ph, 220/440 Stand & foot chain vise.